The New York Times Crossword app has been released for both Windows Phone and Surface, bringing perhaps the most well known and popular daily crossword to your devices. It is the perfect way to take on the challenge of the crossword game, which began publishing in 1942, with you on-the-go and you can do it completely free. 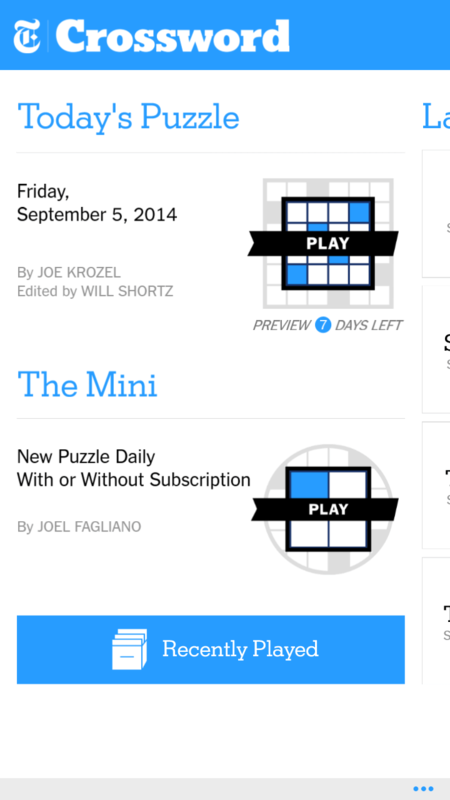 The new app brings you both a daily mini puzzle (for Windows Phone) then the published crossword for the day. You can play either one of these completely free without a subscription to The New York Times and in fact can play the previous 7 days of puzzles for free. If you want to go back further, up to a year on the device and 20 years on the web, you will need a subscription to the service. you would in the paper – by hand by writing. I personally don’t have a Surface so I’ve not tried this but early reports from around the web indicates it works beautifully well. It’s the same puzzle that’s printed every day in The New York Times newspaper. All daily puzzles are available the previous day at 10p EST with a subscription, so enjoy Tuesday’s puzzle on Monday at 10p! Practice and learn how to solve the puzzle on Monday or Tuesday or challenge yourself with even harder puzzles later in the week. So you are getting the real thing every day, not a facsimile. The New York Times Crossword app is free and available now in the Windows Phone Store and the Windows Store.